at random to win a free Ballpark Bunt Box, the company’s newest product. The winning flavor will be announced at the National Baseball Hall of Fame World Series Gala on October 27. 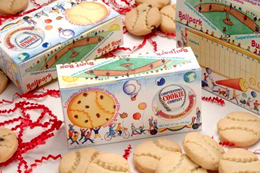 Read our review of the baseball shortbread wonders. Why take out? Visit RealAsianMadeSimple.com to enter to win an authentic Asian dinner for 10, cooked by TV chef Katie Chin, courtesy of Simply Asia and Thai Kitchen. As Halloween approaches, AliveAndCookin.com is inviting people to share their own personal cooking nightmares in the site’s first “Skeletons in Your Kitchen” Contest. The website is looking for real-life kitchen catastrophes to share and laugh about with their readers. Why? According to Cherie Boldt, Brand Manager of Alive & Cookin’, “We all have a humorous cooking story in our past, and reading about someone else’s horrifying cooking experience makes us feel a little better about our own culinary skills.” There are spooktacular gifts, the first-place winner will receive a 20-piece set of premium Stainless Steel Saladmaster Cookware. There are almost 4,000 different species of edible crab, and 1.5 million tons of crab meat are consumed worldwide each year. In the new cookbook Crab, Andrea Froncillio (of San Francisco’s Stinking Rose restaurant) and Jennifer Jeffrey guide you through how to select, clean, prepare and store crab. 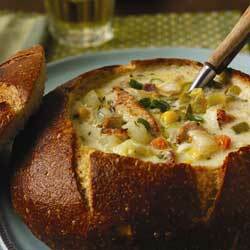 Crab has 35 recipes including the crab chowder in the photo at the right. The next time you have a crab feast, impress your guests with a range of small plates such as Spicy Crab Shooters and Chile-Glazed Crab Lollipops. This week, nearly 20 restaurants in Philadelphia will offer foie gras lunch and dinner dishes for only $5 in response to recent pressure by the animal rights group, Hugs for Puppies, to remove the controversial delicacy from menus. The restaurants, working under the umbrella of Chefs for Choice and the Artisan Farmers Alliance, have banded together to support the right to choose what goes on their menus. They assert, “We do not believe that a minority of animal rights zealots should determine the direction of our business. Nor do we want to be intimidated by them at our restaurants or homes. We want the City Council to know that these few do not represent the whole of Philadelphia.” We’re quite excited about this form of protest and would be even more excited if the foie gras stayed so cheap! To read more about foie gras controversies, see our gourmet news from January and May.